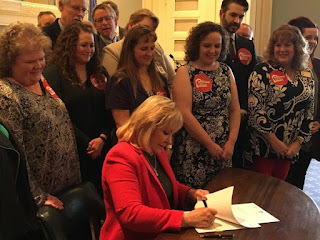 OKLAHOMA CITY – Governor Mary Fallin, flanked by bipartisan legislators and joined by public school teachers, today signed three bills that are part of an historic revenue package to fund pay raises for teachers. The package allows for a $6,100, or 16 percent, pay raise on average for Oklahoma teachers. “This is a very historic day in Oklahoma,” said Fallin. “By signing these measures, Oklahoma will move to second-highest in the region, up from the lowest, in average teacher pay. It is the largest teacher pay raise in the history of the state. House Bill (HB) 1011XX, which puts a $17,000 cap on deductions on adjusted gross income. Charitable contributions and medical expenses are not capped. HB 1023XX, which establishes a new teacher salary schedule, the largest teacher pay increase in state history. Teachers will receive a $6,100 pay raise on average in the upcoming school year. HB 1010XX, which provides the revenue to fund the teacher pay raise. This is accomplished by an increase of $1 per pack of cigarettes; taxing little cigars at the same rate as cigarettes; raising the fuel tax by 3 cents a gallon on gasoline and 6 cents a gallon on diesel; and raising the gross production tax from 2 percent to 5 percent on all wells.